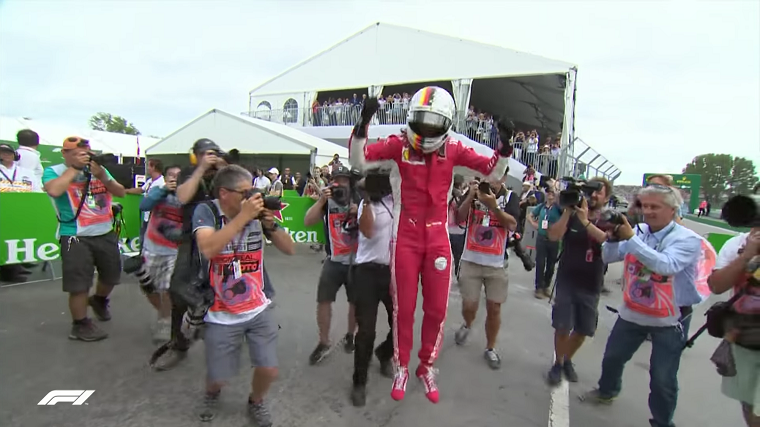 Historically, the Circuit Gilles Villeneuve rarely fails to produce an exciting Canadian Grand Prix, but unfortunately the exception was in full effect this time around. As so frequently seems to be the case, the Formula One race opened with a massive crash on the first lap, which promptly ushered in the safety car. 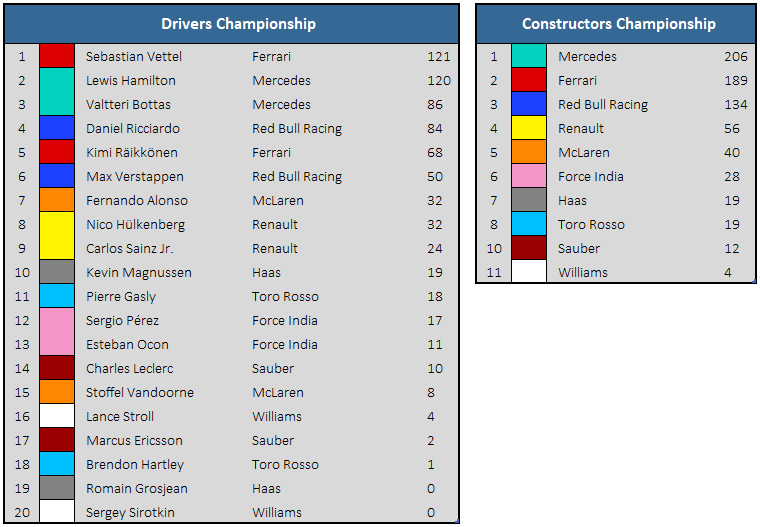 After that, the order was mostly set in stone, with the majority of passes taking place in the pit stop window or when Fernando Alonso’s McLaren broke down. The other two retirees were Lance Stroll and Brendon Hartley, who collided on the first lap when the former lost control. It was an especially unfortunate moment for the driver from New Zealand, who had been having a poor season up until he had redeemed himself on Saturday with a good 12th-place qualifying run. His teammate Pierre Gasly, who started 16th, finished 11th, suggesting that Hartley could have scored points for Toro Rosso had Stroll been more careful behind the wheel at his home Grand Prix. Interestingly, both McLarens were beaten by a Toro Rosso and a Sauber in qualifying and in the race. These are teams McLaren would have led us to believe they would comfortably beat after changing from the Honda to the Renault engine—highlighting once again that the British outfit likely did everything it could in the past years to minimize its own shortcomings in the media and make Honda a somewhat undeserving scapegoat. At the front the race was disappointedly dull. 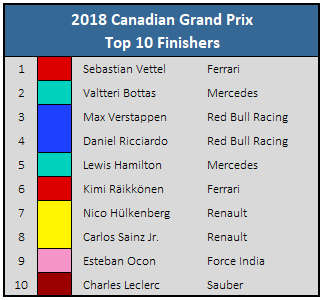 All six drivers from the top three teams had been properly mixed up on the grid, which had seemed to hint at an exciting multi-team fight for the win. But what actually happened was that Sebastian Vettel sped away in the lead and kept it without any trouble whatsoever. Only at the very end of the race did we see some action: Hamilton was putting the pressure on Ricciardo for 4th place, and Verstappen on Bottas for 2nd…but the race ran out of laps before anything could happen. A strange moment came when Winnie Harlow, a model and friend of Lewis Hamilton, waved the checkered flag one lap too soon. Vettel fortunately realized the mistake and did not slow down, though the blunder carried some consequences. As a result of this, the fastest lap of the race was awarded to Max Verstappen for his time on lap 65, rather than to Daniel Ricciardo for his time on lap 70. The next Grand Prix will take place in France for the first time since 2008, and will kick off a streak of three consecutive race weekends for the very first time in the history of F1. If none are more exciting than the Canadian Grand Prix…well, at least we’ll have the World Cup.